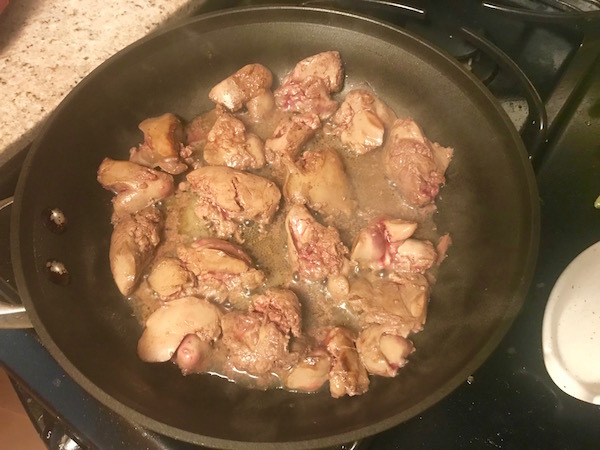 That Time I Cooked and Ate Chicken Livers | Keep It Up, David! I consider myself an adventurous eater, and recently had quite the culinary adventure. I made myself a chicken liver dinner. 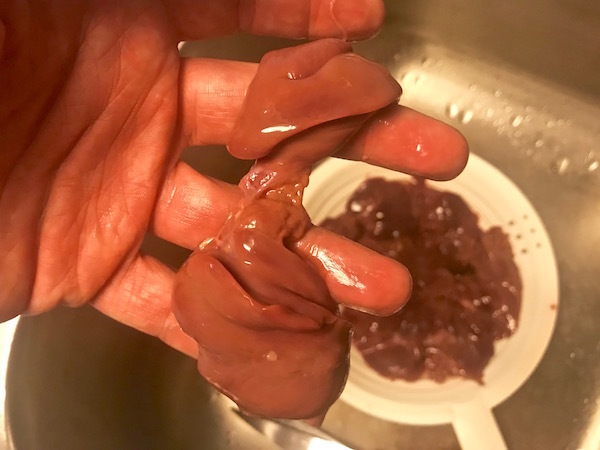 I’ve only had liver a few times in my life: I’ve tried duck and chicken livers in a few pates and mousses at fancy restaurants and parties, and I think I’ve tried a sliver of liver at Thanksgiving, before my brother-in-law used it and the other organs to make gravy. My friend Dan is a big fan of liver for the nutritional benefits: it’s high in iron and zinc and loaded with B vitamins. I watched him buy beef liver when we went to the farmers market the other week, and it inspired me to try liver myself. I decided to start small, and chicken livers are pretty small. I bought a frozen pouch, nearly a pound, and after hanging out in my freezer for over a week, I finally summoned the courage to thaw it and figure out what to do with it. I read a bunch of recipes online, and decided to stay simple. 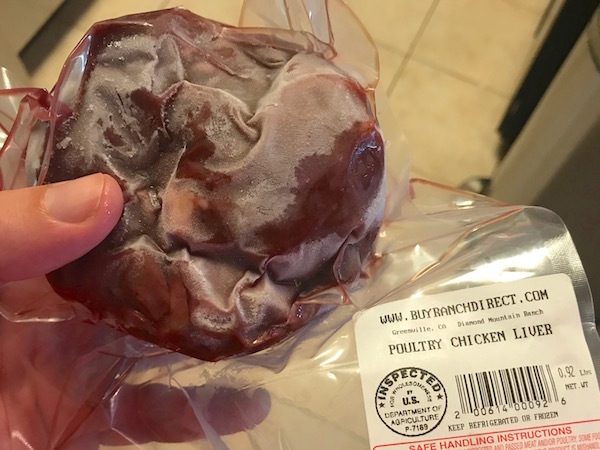 First, I rinsed the livers, and discovered that they have two lobes, so I cut the thin part that connected them, separating each liver to two pieces. The pouch had about ten livers, so I ended up with 20 pieces. 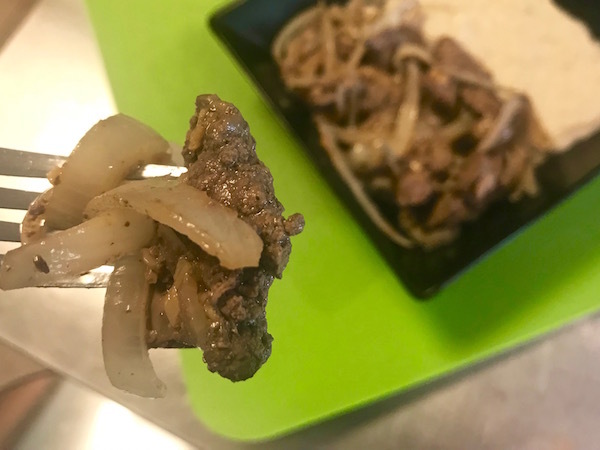 I read that it’s best to not use any oil when cooking livers in a skillet, because you don’t want any sear on them, which could prevent them from cooking evenly or make them tough. So I did a dry fry, and soon enough, they released liquid, and although they’re lean, a little fat rendered out of them too. They cooked quickly, in less than five minutes, and after piercing the thickest part and seeing that they were all brown with no pink, I used a slotted spoon to move them into a bowl. Then, in the liver fat and juices, I sauteed 1/2 a yellow onion and a couple tablespoons of garlic. Once the onion had softened, I tossed the livers back in, just to warm them up again, and drizzled a touch of lemon juice and olive oil on them. Meanwhile, in a separate skillet, I heated up mashed cauliflower with garlic, which I bought frozen at Sprouts and cooked according to the package. All in all, it made for a delightful meal! The flavor was strong, and the livers were tender, almost creamy. I understand why they’re popular in silky mousses and pates. While I didn’t find them particularly smelly while eating them, the cooking process stunk up my kitchen pretty badly for the better part of a day, and since my kitchen, dining room, and living room are all one big room, that meant my whole place smelled. I enjoyed them, and am curious to move on to beef liver, which I’ve never eaten before – but I’m not going to rush out to buy it. I’ll wait until I’m feeling adventurous about liver again! I’m glad I tried chicken livers, and my dinner was filling and satisfying, but I think I’m fine if I just enjoy it occasionally. But my desire to try new things is a continual hunger… and I already have the next experiment awaiting me in my freezer! Stay tuned. This entry was posted on Thursday, August 23rd, 2018 at 12:11 am and is filed under Uncategorized. You can follow any responses to this entry through the RSS 2.0 feed. You can leave a response, or trackback from your own site. 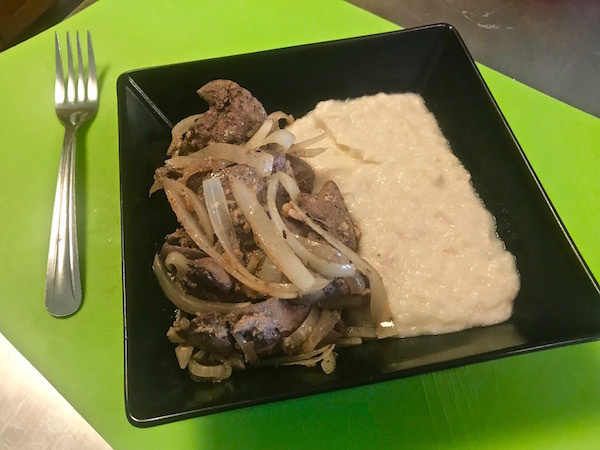 Calves liver and onions are tasty, but you will do your research on how best to cook them. I think my Mom used to sautee them, possibly coated in flour. Again will smell up your home. I’m curious about their nutritional value also. But I know you’ll report on all I need to know!! That’s one family meal that didn’t jump from one generation to the next! You must have not been a fan. I must say that looks good David. I don’t think I have ever had chicken liver, but am a huge fan of beef liver. I like it sautéed with bacon and onions. Probably not the healthiest with the bacon, but it really makes it good. Funny thing though, I can’t cook it myself because I can’t stand the look of raw liver! Lol I have to enjoy it in a restaurant! Looking forward to your next food adventure! Keep it up David!! Hmmm bacon makes everything better, that’s a great idea! Thanks and glad you enjoyed! I am NOT as adventurous!!! And …I can’t get past the smell!!! Lol. Kudos to you for being adventurous and trying them!!! Thanks! And I’m sure you could find *something* that you could try!